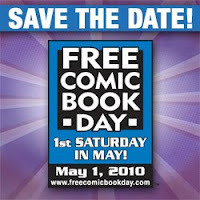 I hope you've all marked your calendars for Saturday, May 1, as it's the day where you can go to participating comic book stores to get some free comic books! Find a store near you on the Free Comic Book Day website. As for me, I'll be tabling with Art & Story co-host and Sugary Serials collaborator Mark Rudolph at Green Brain Comics all day long! I'll be giving away free Sugary Serials comics to kids and drawing crayon sketches for anyone who wants one. And on Sunday don't forget to check out the Comic Artists Forum at the Ann Arbor District Library. This month's guest advisor will be Ryan Estrada of Aki Alliance and Flight Volume Four. It's going to be a very sequential weekend!